Brach's Mellowcreme Candy Pumpkins. These taste very similar to candy corn, however they have a slight marshmallow flavor. 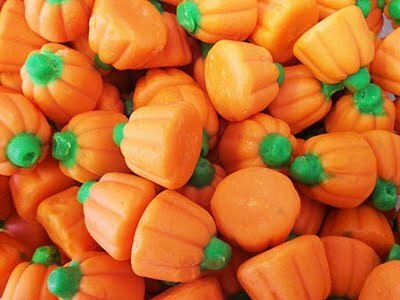 There are a few different candy companies that make these little pumpkins but Brach's brand are the number one seller in America. Who can resist this cute and tasty pumpkins made with real honey ? These were one of my favorite Halloween candies I ate as a kid and I have to admit even as an adult I love these little pumpkins. Most kids will go for the chocolates, but not me. I would get all excite as Halloween would get closer because I knew that soon I would be able to get my pumpkins. I can remember one year I went with my dad to JC Penny's auto center with my dad. He was getting a new tire and told me if I was good we would make a trip to the candy counter. Oh how I waited sitting still for that long was really hard, but knowing the candy counter was coming next I did it. Once we got to the counter there was no decisions to be made I knew exactly what I was going to get and could not wait until the lady behind the counter was finished taking care of the lady that could not make up her mind what she wanted . I knew I was next and my mouth was watering for the pumpkins. I got a little bag full of pumpkins and left the store with my bag in one hand and my dad's hand in my other hand and a huge smile of my face. We decided we were going to stop and see Grandma and Grandpa. Oh what a great day this was turning out to be. Once we got to Grandma's house I went in the bathroom to wash my hands before eating my candy. I was coming out with part of my pumkin in my mouth, part in my hand still holding tightly to my bag. I was heading to the kitchen by my Grandma and dad when I stopped by Grandpa who was sitting in his chair watching TV. As soon as he looked at me he jumped out of his chair grabbed my candy pumpkin out of my hand was yelling at me. I was shocked as to what I did this time to get in trouble. I ran into the kitchen crying with Grandpa on my heels calling " Ma the girl is eating your soap" ! I could not figure out why they were being so mean. Grandma was now laughing, Grandpa yelling and me crying. Grandma then took me by the hand back to the bathroom and showed me on top of the vanity there was a little pumpkin container and in it there were little soaps that looked just like my candy pumpkins. She told me Grandpa thought I was eating soap and didn't want me to get sick. To this day whenever I see these treats I think back to when Grandpa thought I was eating soap and I have to smile. While most adults are eating candy corn, not me I still go for the pumpkins. 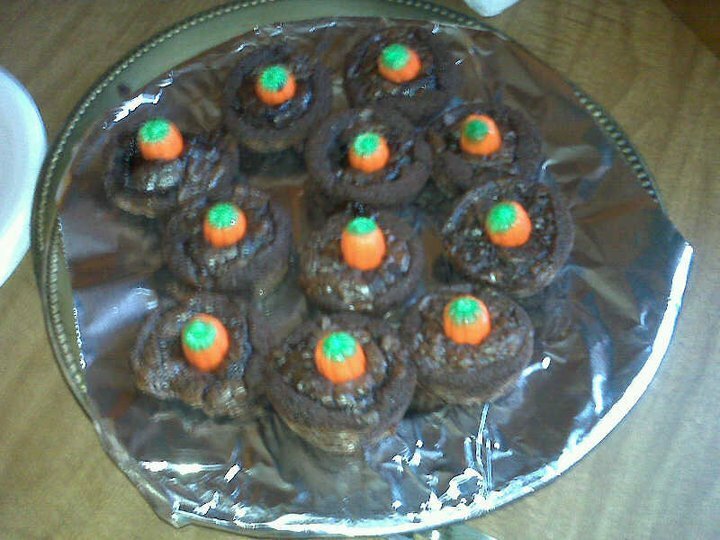 Not only are this great to put in your candy dishes they also are great for adding to your Halloween baking.